ThinkTime provides a clear, consistent and user-friendly platform for every task - from complex corporate initiatives to simple to-do items. Each assigned task appears in a personalized dashboard with a priority level so associates know exactly how to organize their time. Field and corporate leaders can balance the flow of work week-to-week so no store team is overloaded. Work for ThinkTime Task Management? Learning about ThinkTime Task Management? "Step by step achieve your goals "
Tool for task management, with advanced features with which you can manage your tasks in real time, is easy to use and from using the demo until you hire the paid version receive technical advice, lists tasks in order of priority in a custom panel, so you get to distribute the tasks by the role that each member of the team has and by uicacion, the latter in case it is outside the offices and still requires to be informed of whether it has received assignments or their deadlines. Since we handle a lot of incoming and outgoing merchandise nationwide, it was important for us to find a way to manage our tasks in an organized manner that would not affect delivery times to our customers. We use the demo as a test to meet our customers and it is definitely one of the best in task management. Unfortunately our company due to lack of budget was not able to realize the acquisition of the paid version of the software. What Retail Task Management solution do you use? ZetesAthena Retail Task Management software allows you to manage store tasks intelligently whilst providing real-time visibility. You will empower staff with a powerful retail application that removes manual work and automates tasks such as shelf-replenishment, inventory checking, returns processing etc. It will allow you to fully control your shop floor and back-of-store operations, and ensure tasks are completed at the right time, by the right person. Zaptic makes continuous improvement digital, social and mobile, turning every worker into a multi tasking problem solver capable of preventing, identifying and eliminating losses. AccuStore is real-time retail: the ability to use field task management to react quickly to and even anticipate change. Its an easy-to-use, mobile solution that empowers your team to help with information gathering and sharing of essential data in real time. HubWorks lets you run your business anytime, anywhere and from any platform. Compatible with desktops, laptops and all internet browsers. Designed for Apple, Android and Microsoft tablets. Free mobile apps for iPhone and Android. * We monitor all ThinkTime Task Management reviews to prevent fraudulent reviews and keep review quality high. We do not post reviews by company employees or direct competitors. Validated reviews require the user to submit a screenshot of the product containing their user ID, in order to verify a user is an actual user of the product. Hi there! 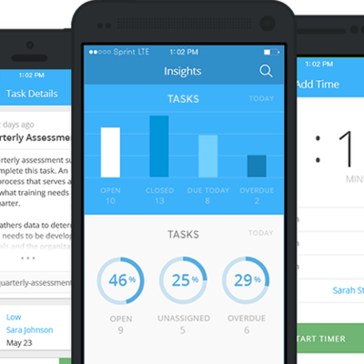 Are you looking to implement a solution like ThinkTime Task Management?